A triceps rupture occurs when the triceps tendon tears away from its attachment to the olecranon, a bone in the forearm. 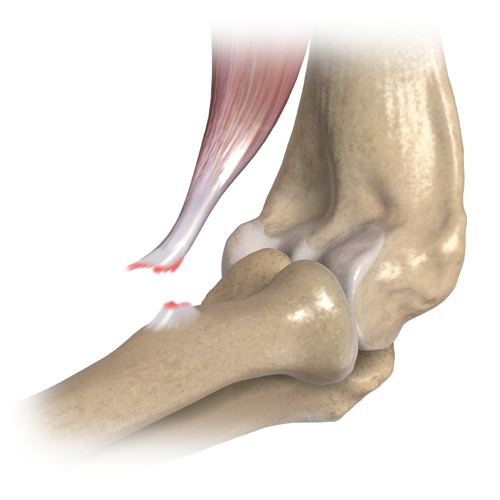 The triceps tendon is responsible for turning and extending the elbow. Unlike the shoulder, there is only one attachment site for the triceps tendon in the forearm. Therefore, patients with triceps ruptures will have significant loss of strength in extending the elbow. Triceps ruptures generally result from falls. Tendonitis, or inflammation of the portion of the muscle which attaches to the bone, may precede the rupture. With triceps ruptures, patients often feel a 'pop' on the back of the elbow, followed by immediate pain and swelling. A bruise forms over the lower arm and elbow. There will be an immediate loss of strength. When the swelling subsides, a deformity will be present in the arm. Because the triceps muscle is under tension, it will retract up into the arm if its distal attachment ruptures. This causes the muscle to appear hollowed out in the lower part of arm, and balled up on the back of the arm. Your surgeon will perform a thorough history and physical exam with X-rays. A deformity is present and there is significant loss of motion and strength. X-rays are typically normal. MRI is helpful in confirming the diagnosis. Partial thickness triceps tendon tears can be treated non-operatively. Your surgeon may recommend a sling for comfort, medication, physical therapy, cryotherapy and activity modification to reduce the pain and inflammation. Non-operative treatment of triceps ruptures is not recommended because of the loss of function. Operative repair is recommended for all triceps ruptures. This is completed through an incision on the back of the elbow. Multiple techniques exist for repairing the triceps back to the olecranon bone, including sutures, anchors and/or screws. Postoperative medication and physical therapy is at your surgeon’s discretion. The ulnar collateral ligament, also known as the medial collateral, or 'Tommy John' ligament, helps to stabilize the elbow joint. 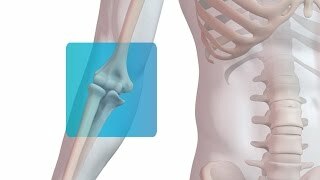 It does so by connecting the ulna (forearm bone) to the humerus (upper arm bone). 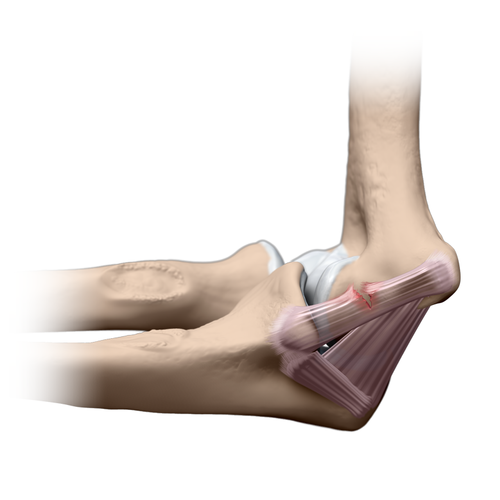 When this ligament is stretched, or injured, the bones of the elbow may separate during intense activities, such as throwing. UCL tears are caused by trauma or overuse. These injuries occur with direct blows to the outside of the elbow, or with elbow dislocations. In throwing athletes (baseball, softball, javelin), repetitive use may lead to stretching of the ligament. When the ligament is stretched too far, it no longer functions. Throwing related tears of the UCL occur with overuse, or when the muscles that stabilize the elbow joint are fatigued. UCL tears cause pain, specifically during throwing movements as the arm is stressed as the arm begins to move forward. Patients will complain of pain over the attachment site of the ulnar collateral ligament on the ulna. There may be swelling in the joint, bruising, and loss of elbow motion. In tears that occur suddenly, a 'pop' may be heard or felt. Throwing athletes will complain of loss of velocity and control. Your surgeon will perform a thorough history and physical exam with X-rays. Your surgeon will press on the ligament and reproduce pain. Swelling or motion loss can be identified in the elbow. A milking maneuver or moving stress test designed to test the ligament causes pain. X-rays are usually normal, but in severe case, a stress x-ray of the elbow may show widening of the joint. An MRI may show the tear, particularly if it occurs in the setting of trauma or if there is fluid in the joint. For tears occurring without trauma, such as those in throwers, the ligament may appear normal on MRI. Adding dye to the joint prior to the MRI will increase the likelihood that a tear will be identified. UCL tears can be treated non-operatively in patients that don’t plan on returning to sport. Partial tears in throwing athletes may be treated non-operatively and may consist of anti-inflammatory medication, physical therapy, cryotherapy and activity modification. A trial of return to sport is attempted after a period of time determined by your surgeon. UCL surgery is recommended for those with full thickness tears and/or those that fail non-operative treatment. Surgical technique depends on the type of tear: acute or chronic. For acute tears, UCL repair with suture augmentation may be possible for full symptom relief. The return to sport timeline may be significantly less with UCL repair versus reconstruction. If repair is not possible, formal UCL reconstruction is performed using a graft (either from the same or opposite wrist, or from a donor) to replicate the original ligament and held in place by suture, anchors or buttons. Post-operative medication and physical therapy are at the discretion of your surgeon. A distal biceps rupture occurs when the biceps tendon tears away from its attachment to the radius, a bone in the forearm. The biceps tendon is responsible for turning the palm face up and for flexing the elbow. Unlike the shoulder, there is only one attachment site for the biceps tendon in the forearm. Therefore, patients with distal biceps ruptures will have significant loss of strength in rotation of the forearm and elbow flexion. Distal biceps ruptures generally result from heavy lifting, particularly with the elbows bent to around 90 degrees. Tendonitis, or inflammation of the portion of the muscle which attaches to the bone, may precede the rupture. With distal biceps ruptures, patients often feel a 'pop' in the elbow, followed by immediate pain and swelling. A bruise forms over the lower arm and elbow. There will be an immediate loss of strength. When the swelling subsides, a deformity will be present in the arm. Because the biceps muscle is under tension, it will retract up into the arm if its distal attachment ruptures. This causes the muscle to appear hollowed out in the lower part of arm, and balled up in the upper part. Partial thickness distal biceps tendon tears can be treated non-operatively. Your surgeon may recommend a sling for comfort, medication, physical therapy, cryotherapy and activity modification to reduce the pain and inflammation. Non-operative treatment of distal biceps ruptures is not recommended because of the loss of function. Operative repair is recommended for all distal biceps ruptures. This is completed through one or two incisions. Multiple techniques exist for repairing the distal biceps back to the radius bone, including sutures, anchors, buttons and/or screws. Postoperative medication and physical therapy is at your surgeon’s discretion.